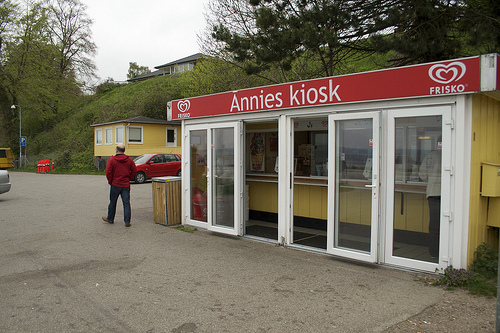 Annie’s Kiosk is a small snack hut on the scenic way from Sonderborg to Flensburg. Small as it might be, it punches above its weight; it even has a long wikipedia entry in German! The kiosk is famous for its hotdogs (and ice-creams). In typical snack hut style, you walk up to the window, order your hotdog – different choices of sausages, mustard, ketchup, remoulade, fried onions, raw onions and pickles – pay, and then get to enjoy it on the open-air benches and tables to the side. 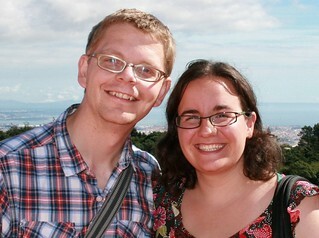 There you can get a good view of Flensburg Fjord and Store Okseø. The kiosk is a favourite stopping point for motorcylists and drivers in the area. It served as a perfect stopping point for us after visiting Cathrinesminde Teglværk in Broager in the morning and before continuing onwards to Frøslev Prison Camp in Padborg, while allowing us to enjoy the scenic views down to the kiosk. This entry was posted in Things To Do and Sights and tagged Annie's kiosk, brickworks, Broager, Cathrinesminde, fjord, flensburg, Froslev, hotdog, ice/cream, Padbrg, polse, Sonderborg, Store Okseo, taglvaerk by Ann. Bookmark the permalink. You should visit Annie’s Kiosk on a tuesday late afternoon / evening.